It’s 5.45 on the morning after the longest day of the year. It’s warm but the sky still has the soft pale blue, almost white, look of dawn. The sun, low and hazy, has yet to stoke and build up her heat. The brick steps are still cool and there is freshness in the shadows. We are up, the whole family and, with barely a tussle, have managed to assemble - bleary and blinking - by the car. We drive through the sleepy, breezeless countryside past putty coloured olive groves and inky cypress trees standing still, silent and spellbound as the Sunday morning bells ring in the day. Soon we arrive at Citta della Pieve keen and hungry. Here the streets are being carpeted with flowers and it is this that we have come to see, the Festa dei Fiori in honour of S.Luigi Gonzaga, protector of the Casalino Terziere. These beautiful decorations are made once a year on the nearest Sunday to the Summer solstice. The festival’s origins are lost in the mists of time but some say it marks the solemn procession of Spring. Many of the designs are traditional, taking their inspiration from the Renaissance and the local master Perugino, but every year new designs are added in rich and subtle colours. Flowers and scented herbs are grown in the surrounding countryside specially for this extravaganza and for 3 months prior to the day locals collect and dry the blooms and seed heads in preparation. No money changes hands, it is simply the Italian way. We wanted to be in Citta della Pieve early in the day to see the work in progress, volunteers have been up through the night creating these vibrant scenes. Ordinary people, nonnas and nonnos with their grandchildren, the man from the bar and another, the big gruff man who sells tickets for the Perugino and hides his broken smile. 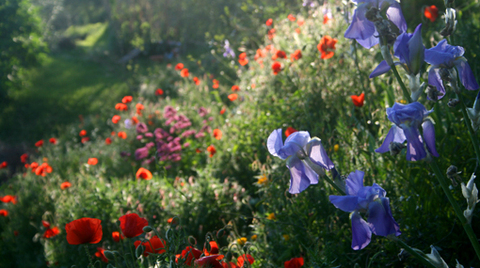 Today he walks up and down spraying the flowers with sugar water which will harden and set the blooms. There is an atmosphere of hushed business and an up-beat vibe. The whole place glows in the intensifying sunshine, the vivid colour of the petals radiant against the old stone and red brick of the town. This wonderful show of dedication and artistry is made all the more fascinating by it’s fleeting nature, later this evening a procession of townspeople will walk over the flowers to the main piazza scattering the blooms to the gutter in their wake. As we walk between the images taking photos, laughing with our girls, chatting with the old guys, restraining the dog and stopping for cappuccio and cornettos, I have to admit it was well worth the wake up call. Yes it’s hot, but sometimes only risotto will do. There is something so therapeutic about the making and eating of risotto, the ritual of adding the stock and stirring, watching while the little translucent grains grow plump and creamy. Followed by the soothing balm of eating a bowl full of bliss. A good risotto can calm a frazzled spirit, comfort a fragile soul and even cure a hangover! But for this magic to work it has to be made well and that means practice. The rice should still retain a slight ‘nutty’ bite and the consistency be an unctuous oozing mass, not too soupy, not too stiff. Find a good recipe for risotto bianco and get practising, I suggest ‘The best of Anna Del Conte’. It is this book that gave me a great tip for preparing risotto in quantity without having to stand and stir, red in the face, while others are knocking back the aperitivo. ‘Jamie’s Italy’ also has a good variation. Once you’ve got the knack there is no limit to the good things you can add to your risotto. With a nod to Jamie (and for a big gutsy flavour) I stirred in soft caramelised roasted fennel and boosted it with crushed fennel seeds, lemon zest and the subtle hint of peperoncino and, what do you know, even marito’s hangover was cured! Around 10 years ago there was a great deal of excitement about the 500th Anniversary of the death of one of the greatest Renaissance painters, Piero Della Francesca. I remember being on holiday in Italy at the time and tearing around with Marito to various churches, museums and small towns to see as much of his work as possible as quickly as we could, The Piero Trail. There were so many highlights, including my personal favourite, the serene Madonna Del Parto , but the one that perhaps stands out the most in terms of its sheer magnificence is the Legend of the True Cross fresco cycle in Arezzo. As a story it has all the intrigue of The Lord of the Rings, spanning over 5,000 years from the death of Adam to the return of the cross to Jerusalem. In the middle there is the search for healing oil from the Wood of Mercy, the theatrical angel appearing to Constantine in his beautifully illuminated campaign tent and two tremendous battle scenes. 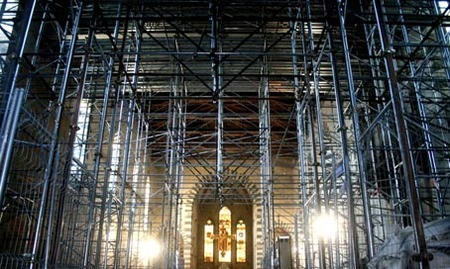 It appears exactly as it would have done, except for the damage caused by earthquakes, lightning, nearby building works and, perhaps the worst of all evils, if you're a fresco, damp. I took some photographs, although I did get told off for doing so. Flash photography causes terrible damage to a fresco, I was once told that one flash was the equivalent of 10 days subdued sunlight, so I am always careful to not use it. So when I asked (politely) why it was wrong, it seems the reason is now copyright. 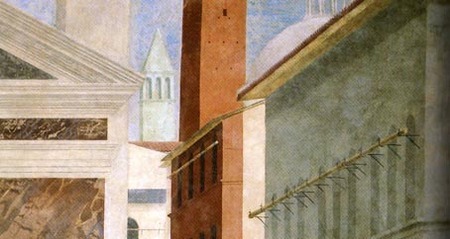 After 510 years I doubt whether Piero Della Francesca would really care that much. Anyway, guilty as charged, here they are. The idea is to make other people want to go and pay to see the frescoes, so I guess it all works out ok in the end. The History of Art really is food for the soul, it's history with pictures, a wonderful subject for anyone with their eyes open to ideas and creativity and, whether or not you love the art, it represents an aspect of human endeavour which shapes the world we live in. Seems like nature’s doing a pretty good job too, it being so juicy green and blooming beautiful around here these days. Sometimes the best thing you eat has less to do with the actual food itself and more to do with the location in which you eat it, or the company you're with. So it was with my Panino con Tonno e Capperi, oily and delicious indeed, but it would hardly have drawn a crowd. However, add to it the location, (a bustling outside café under Vasari’s gracious loggia in the stunning town of Arezzo) the company, (two of my favourite Italophiles and fellow bloggers, the olive notes) a little sunshine and the famous Fiera Antiquaria. Mix it all up and stick that in a Panino – ‘perfetto’! During the Easter break we shed our builders’ overalls and travelled by train to Florence for another quick fix of culture. 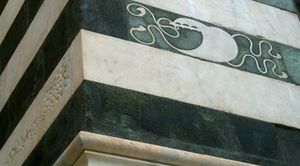 We chose Santa Maria Novella, not because it’s a stones throw from the station, nor because of it’s ornate green and white marble façade but because it really is a marvel. So jam packed with Renaissance goodies that at two and a half euros for the entrance it’s got to be the best value for money in town. Despite the lure of an early Masaccio fresco and the tormented beauty of Brunelleschi’s crucifix, what really does it for me is the Tornabuoni chapel, frescos by Domenico Ghirlandaio. The name Ghirlandaio means garland maker and was a nickname passed down by his father, a goldsmith who made gold garland-like necklaces for the wealthy women of Florence. From his father’s workshop Ghirlandaio was said to have begun his career making drawings of the passers-by. His skill for portraiture is displayed at it’s best in these striking frescos commissioned by the banker, Giovanni Tornabuoni. Despite the subject matter being the lives of the Madonna and St John the Baptist there are no fewer than 21 portraits of members of the Tornabuoni family and their circle depicted here. This might explain why certain illustrious ladies of Florentine society are shown as if present at the births of both St John and the Virgin. These beauties include the ill-fated Ludovica Tornabuoni, the patron’s only daughter, who never saw her prominent portrait as she was to die in childbirth aged 15 before it was finished, making the scene even more poignant. 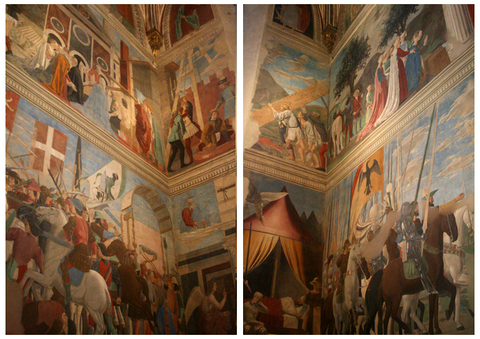 As a snapshot of 15th Century life in Florence, no frescos are more fascinating. There is a strange, almost Disney-like quality to them and the interior detail is compelling. Imagine the impact when these gaudy scenes were revealed to the god-fearing Florentine masses in all their technicolour glory. Here there are no imaginary celestial settings but the real, elaborate halls and bed chambers of contemporary Florence, peopled by the wives and daughters of the rich. In a world without glossy magazines, TV shows or shopping channels they were like a Florentine soap-opera, the first ever reality show and they caused a sensation. John Ruskin snippily said of them that “if you are nice person they are not nice enough” and “if you are a vulgar person, not vulgar enough”. To me they are nice and vulgar! As you leave you may notice a large carved, wooden pulpit, it was from here that the zealous Dominicans first denounced Galileos daring realisation that the earth revolved around the sun and not the other way round. And, in a dimly lit corner with no label or sign attached, is a small but exquisite water stoop carved by a young Michelangelo. All this for two and a half euros! What more could you ask for, (although marito remarked cynically that it used to be free). It’s a little early I know (the true season for Italian asparagus being the end of April to the end of June) but I just can’t wait. Slowly, gradually it is beginning to appear on the market stalls. I’ve been holding back knowing my greed for asparagus knows no bounds, not wanting to waste the first taste of the year on something lacking and inferior. But then, as luck would have it, I was invited to join some neighbours for supper and there it was, the first course. A large white platter, piled high with beautiful, glistening spears of silky green asparagus, briefly boiled and tender to the bite. The partner to this heavenly vision was a large bowl of lovely, fat, wobbly home-made mayonnaise. And so, I declare the asparagus season (in this house) has begun. Anywhere you can, before I do. A hard frost is on the ground and mist is in the valleys, rising up from between the bald scrub oaks in whisps and spectres. In the distance the milky mountains roll back like time, Umbria morphs into Tuscany and soon we are in Florence, waiting on the cold stone steps of Santa Maria del Carmine to see the Brancacci chapel. It was on these steps that Michelangelo's nose was broken in a brawl. But that's another story, today we are here for 'Mad Tom', Masaccio. The Brancacci frescoes were commisioned in 1424 by the Brancaccis, a family of wealthy Florentine silk merchants. It was while working on these frescoes that the 22 year old Masaccio began to really shine, usurping his teacher (Masolino) and emerging as a compelling talent. His desolate depiction of Adam and Eve howling in their nakedness as they are cast out into the world is worth the ticket price alone. In the panel 'St Peter Enthroned', Masaccio has painted himself as one of the figures to the right of the throne. He stares boldly out as he touches St Peter's hem for luck, a luck that could not save him as he was to die just 3 years later. But it's more than a signature, it is a brazen flourish of humanity. It says "Look at me. I did this wonderful thing. I was here". Masaccio never completed his paintings in the chapel and, in a shift of politics, the Brancaccis were exiled. 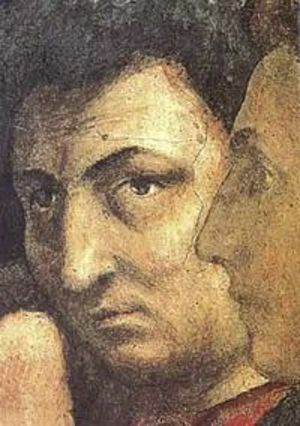 50 years later, after the dust had settled and long after Masaccio's death, the artist Fillipino Lippi finished and 'restored' the frescoes. It was a different kind of human emotion that prompted Lippi to paint out the arm that dared to touch the saint. He would have had to look Masaccio in the eye as he worked and, I wonder, did that open, steady gaze trouble him as he applied the tempera? Did it disturb his dreams? At this time of year I always feel the urge to gorge on dark green veg. Maybe it's a kind of detox, an antidote to the excesses of December. 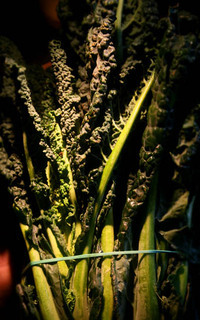 Kale or spinach will do, but best of all is the 'king of cabbages', Cavolo Nero. Its tightly crinkled, black/green leaves look so enticing when sold in large frosty bundles on the market stall in Chiusi. I lug them home and use a long sharp knife to separate the leaves from the central stem. The deep, sweetly pungent flavour is full of 'brassic' goodness. I have been toying with the idea of cooking them with lots of garlic and stiring the resulting puree into wet, creamy polenta (River Cafe Green) as a sort of yin/yang/flavour/colour thing. But maybe it's best not to mess, as it's hard to beat the joy of cooking it in it's simplest form. All you need to do is boil until 'al dente', drain well, slug in the olive oil, sea salt, and black pepper, and pile the dark glistening leaves around a couple of plump and spicy sausages or any sticky roast. Then, open a bottle of good red wine and invite me round for supper. In my previous life I would have liked to have been present at the illustrious gathering in Rome in 1546 during which Cardinal Farnese asked his bearded bumptious friend Giorgio Vasari to assemble a " catalogue of artists...". Perhaps I could have been the slightly faded courtesan in the shadows, dressed in second-hand silk with a whisper of ermine. I would have leaned in with naked curiosity as the conversation took its turn and Vasari paused to draw the breath that would exhale his magnus opus, 'The lives of the most excellent painters, sculptors and architects' - more comonly known as 'Vasari's Lives'. Born in Arezzo, Vasari initially trained as an artist and was very successful, but he obviously became so much more than that - in fact he became what Malcolm Gladwell calls a 'connector' with his finger on the very pulse of his day - a kind of impresario, remembered for his rather pedestrian painting and his innovative architecture, but most of all for his unique insight into the art history of the Renaissance. His biographies are full of juicy snippets of gossip and, although many of his anecdotes have the ring of truth to them, I wouldn't be surprised if he'd made them up either and, frankly, I don't care. He is hugely opinionated and biased, but that's what makes him so readable. Love him or hate him, in the world of the Renaissance, it's hard to ignore him. Vasari mada a fortune and bought himself a small palazzo in Arezzo "with enough space to make some beautiful vegetable gardens". We went there to have a look. 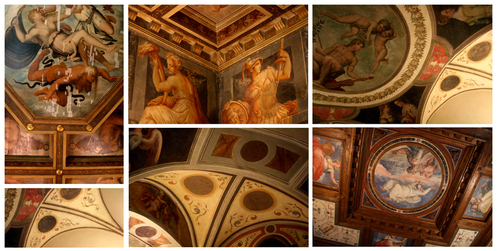 The house is lovely; frescoes by his own hand, a visual ode to himself, and why not? Controversial I know, but I like a bit of rabbit. Growing up in the Norfolk countryside, it was something we ate quite a lot. I remember the excitement of my grandparents arriving on Christmas Eve, their car loaded with presents, and a seasonal Rabbit Pie for supper. Fluff and cuteness aside, rabbit is, surely, a healthy and a free-range (or wild) ethical choice. Its mild, slightly gamey flavour is flattered by the oily aromatics of shrubby Mediterranean herbs as well as the aniseed flavour of fennel. For lunch in Arezzo today, I chose 'Coniglio alla Porchetta' (roasted with fennel and squashed cloves of garlic). No veg, just a dish of spikey rucola which, with its peppery twang, creates a perfect pairing. Tip - It's called 'alla porchetta' only because the fennel is usually used to flavour pork - there's no pork in this dish. 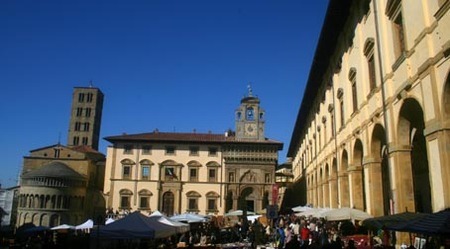 Thankfully my declaration of Winter has proved to be a little premature and, as sometimes happens, the Gods conspire to throw together the makings of a near perfect day; blue skies, russet trees, the low mellow sunshine of Autumn - and Arezzo antiques market. This compelling jumble of tat and treasure is more of a spectacle than a place to procure a crafty bargain. We go with friends who claim to be on the lookout for large wooden rosary beads, “You know, big ones like the chief monk would have used”. We, on the other hand, are determined to buy nothing, steely in our resolve. It doesn’t last long, of course, and within the hour we are haggling over the price of an unfeasably large retro fan. Luckily, we are being tutored in the art of haggle by a ‘grand master’ and, after a flash of the cash and a strategic interlude (during which we visit San Domenico to discuss tactics under the gaze of Cimabue’s strikingly beautiful and asemetric crucifix) we return to the stall and clinch the deal. Kerching! Arezzo is such a classy town, it was recently voted one of the best places to live in Italy (by Italians) and I can see why. Despite being full of Renaissance goodies it still manages to be alive and hip and trendy. It was also home to the effusive artist/architect/writer Georgio Varsari, the ‘Nigel Dempster’ of the Renaissance and anyone who has a real interest in this period really must read his ‘Lives of the Artists’ (Volumes 1 and 2). They are sometimes acerbic, sometimes gushing but always fascinating - a bit like an historic ‘Hello Magazine’. I say this was a near perfect day because, to make it perfect, you should really remember to book a table for lunch. We didn’t. I make this risotto a lot at this time of year and it’s very comforting; savoury, sweet and full of Autumnal goodness. OK, this is more of an idea than a recipe because I’m sure most of the people reading ‘The best thing I ate’ have some idea how to cook. A quantity of pumpkin depending on how many people you are feeding. Chop it into cubes and simmer half of it in a little stock until soft and then puree it. The rest, roast in the oven with olive oil, some branches of thyme and a sprinkle of sea salt. Meanwhile, make a white risotto, with onions, garlic, white wine and stock and, just before it is ready, stir in the pumpkin puree with a slug of cream (or not) and lots of parmesan cheese. Just before you serve it add a handful of rucola and stir again. Serve with the roast pumpkin and thyme piled artfully on top. I’ve also made this with small wedges of red onion roasted along side the pumpkin and served it without the rucola. Although it may seem like a pain to cook the pumpkin in two different ways, this risotto is all about texture as well as flavour. So give it a try. 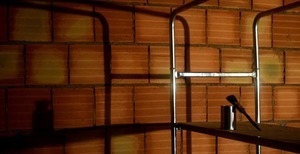 Trying to explain to a bricklayer that you don’t want straight walls is a conversation you don’t want to have in a foreign language. He probably assumed the real meaning was lost somewhere in translation, and it probably was, however, despite a fair bit of inexplicable muttering from both of us, we are getting what we want, we think. As an antidote to the new/old walls palaver at the house, and as I seem to be (in the words of a familiar but forgettable song from the 80’s) ‘always running around, trying to find, certainty’ I went off to do a little research about some rather more beautiful old/old walls, in fact fresco paintings by one of my favourite Renaissance painters, Piero Della Francesca. Piero is one of the greats, not just because of the ease with which he seems to achieve harmony, balance and concord in his paintings, but also in that his figures are all strikingly beautiful, whatever they happen to be doing. His most stunning fresco, the Madonna Del Parto, is in a little hill-top town about an hour north of here, and I have seen it many times, but nearer to us is the fabulous town of Arezzo, and in Arezzo is Piero’s fresco cycle, ‘The Legend of the True Cross’ painted around the altar in San Francesco. The fact that it almost surrounds you on its three sides and having to crane your neck to follow the story from the Death of Adam to the Restoration of the Cross to Jerusalem means that you are drawn right into this colourful and captivating story and perhaps explains why they only allow you half an hour at a time for each visit. Detail from The Legend of the True Cross - not my photo (not allowed). The most magically theatrical part is the Dream of Constantine, set at night in a beautifully lit tent with the angel appearing in bizarre perspective holding a tiny cross of light and pointing with her little finger at the sleeping Emperor. It is truly breathtaking and is worth the entrance fee on its own. Sadly, but reassuringly, many parts of this fresco have been lost over the years to earthquakes, damp and nearby building work, so my return to our crumbling house and to the builders, still seemingly uncertain about what they were doing, made it all not seem quite so bad. Asking my wife what that funny noise was, coming from behind the oven in the kitchen. Our deaf cat and stupid dog having shown no interest whatsoever, I am now obliged to assume the role of ‘man of the house’ and deal with whatever is lurking there.